Agree, the inside line should be flatter / wider, the outside 'speed' line should stay as is, for fast and skilled riders to carry momentum around the turn when descending. 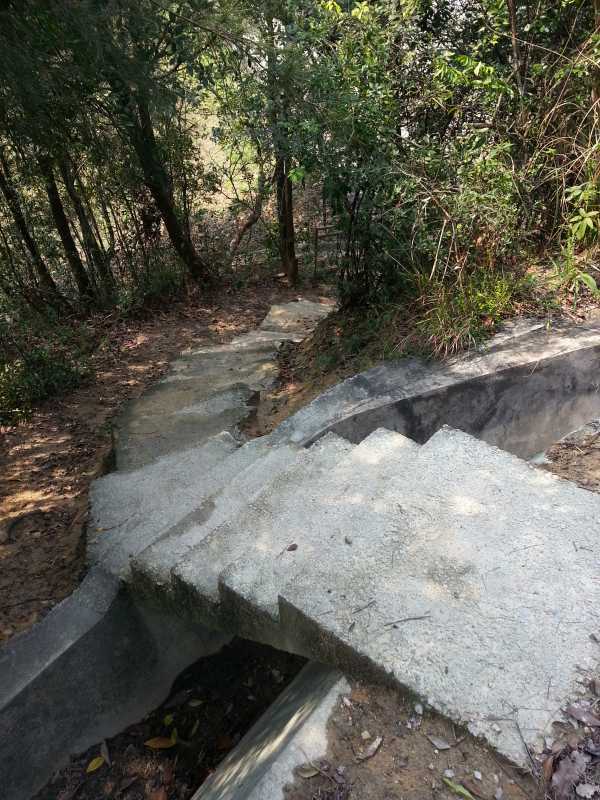 Hikers, slower/less skilled riders will naturally take the inside line, which works to lessen the chance of collision - just need to smooth out that concrete bump and maybe rake away some vegetation. 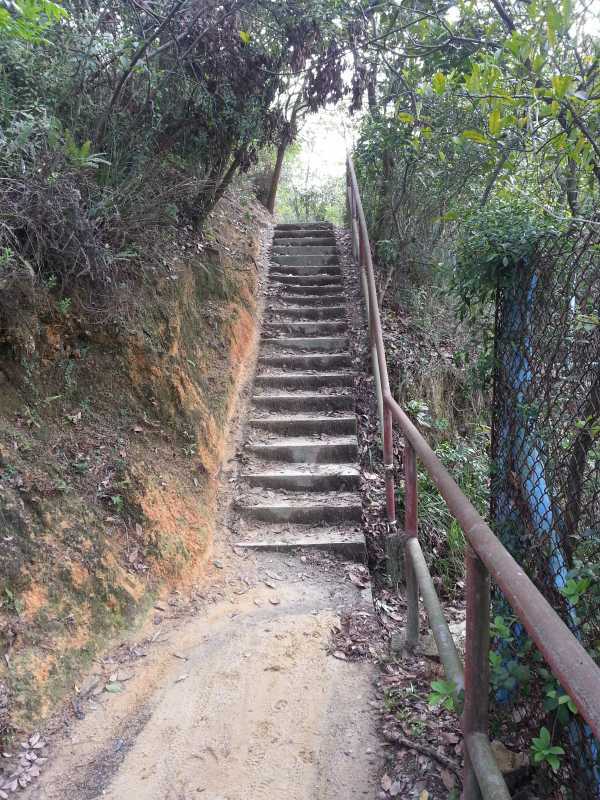 This set of stairs is a major pain...either way its a major hike up with your bike. 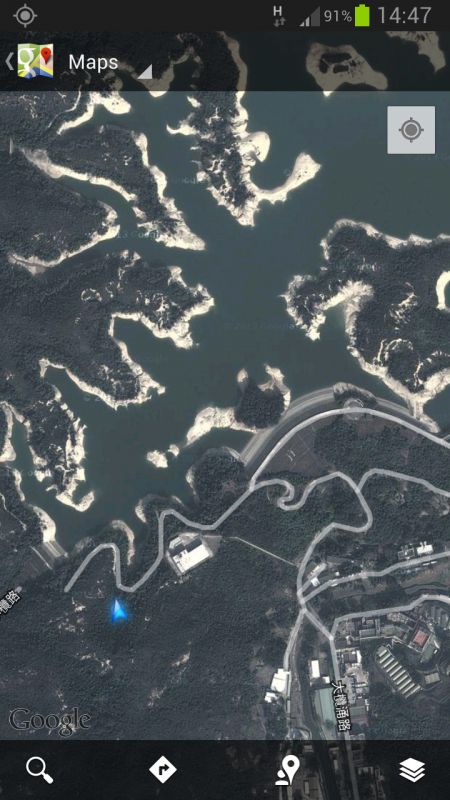 A re-route is possible for the first straight set but as the steeper sets crosses a drain and ends on the dam..it will be more difficult to improve/re-route. Last edit: 6 years 1 week ago by Pk101. 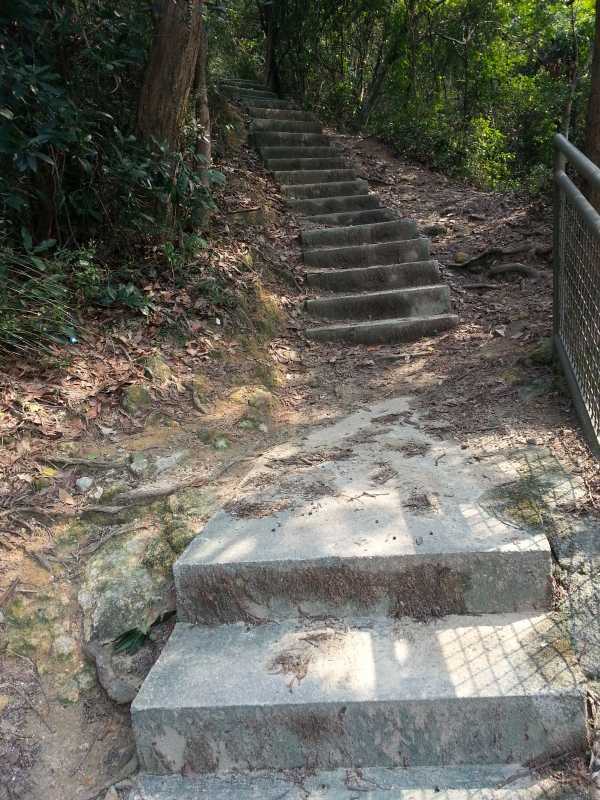 Here are my suggestions for more improvements to Tai Lam resevoir loop. Please dont flame me for changing the feel or excitement of this trail but remember this should be a green/begginer trail for multi-directional riding AND hikers Re-routes or multiple lines provide options for defferent level of riders. 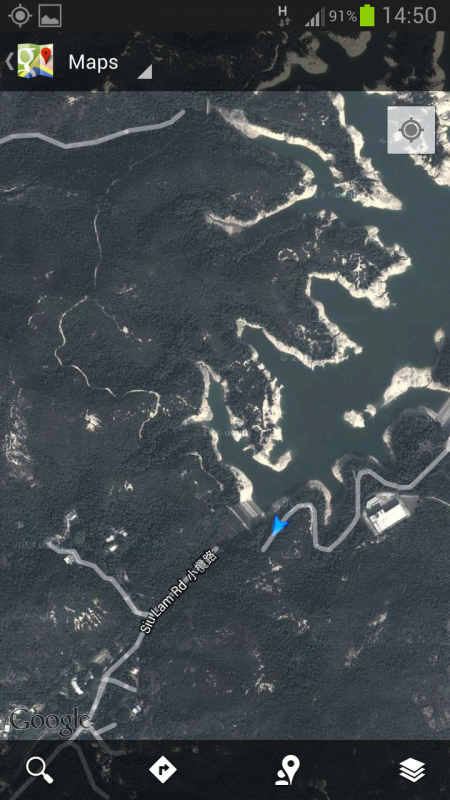 This new batch will deal with the Sui Lam dam entrance towards the road to So Kwun Wat. Ive taken pictures from above and below each feature for reference so you get the idea of what the issue relates to. This is mainly to protect exposed roots and create a ride both ways, going down roots is easy but riding up a narrow side line might not be available if the trail is busy with hikers/bikers. Rain + Mud = Extra FUN for those with SKILLZ so that we can get some RAD AIR AND WHIPS AND ROOSTER-TAILS BRO!!!!11!1!1!! Or something (?). AFCD fixed the improvements they initially started. They have done a good job. A re-route is now open just after the waterfall...that will probably be quite muddy as lots of soil and loose gravel was present last week. The small jump is now the whole width of the trail and root armouring has been beefed up, they should be fine. 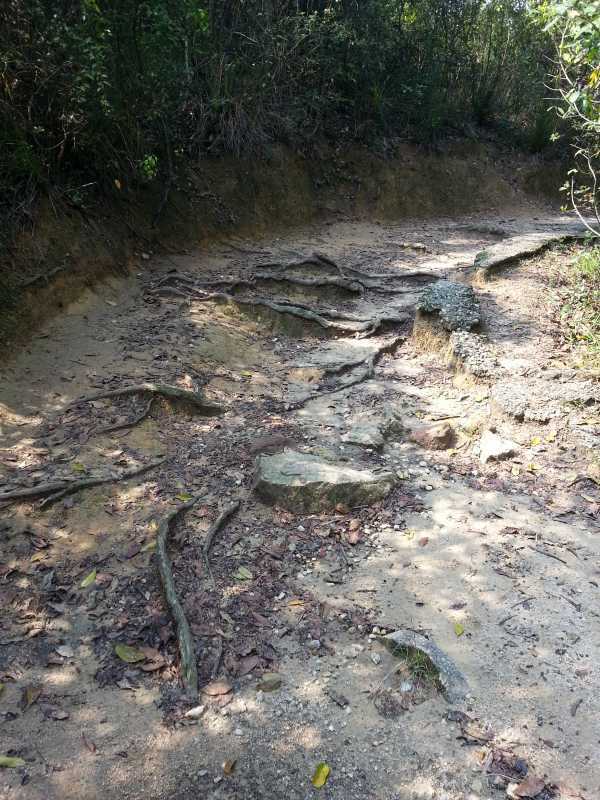 How are the new trails surface holding up after a week of heavy rainfall? 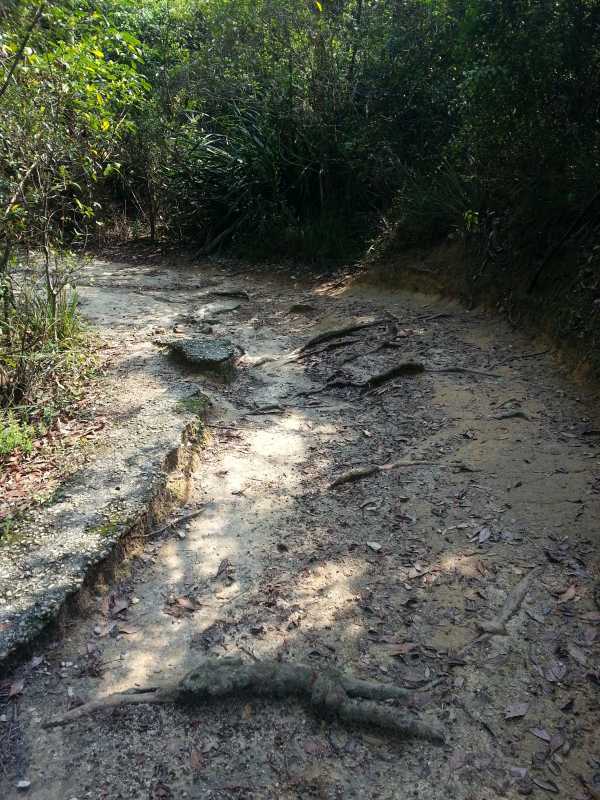 If anybody is not familiar, HM Lim has been consulting with AFCD on all the recent new trails that have been built. He represents IMBA in HK but is based in Singapore through DirTraction. If he has any hand in Tai Lam or any future trails, the future looks bright. 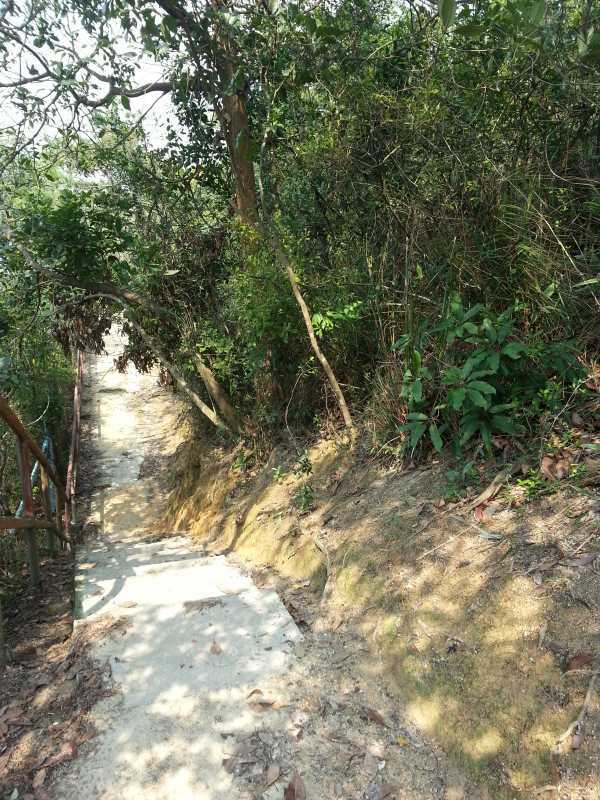 HM, Tai Lam should be the easiest of trails in the park. If AFCD and you can keep the overall feel and make it more accessible to begginers and still make it challenging, then jobs done! thanks for highlighting the problem spots at TLC, those photos and coordinate are great, especially when we have a few hours available between the rest of the stuff at Twisk for TLC at the moment. I hope the 'ups and downer staircase' reroute at 933 785 is a great addition for bi-directional riding, have not see for myself yet. always remember ridability first, challenges 2nd at TLC. We can add proper challenges on top of those reroute and trail fixes, so keep the photos flowing. will try to address and survey these later in a few hrs time, and hope it get implements in the weeks that follows. Here's the exec report prepared by Tony Boone and Jill Van Winkle of IMBA Trail Solutions. www.afcd.gov.hk/english/country/cou_vis/..._mou/files/TLMBT.pdf Table 1 in the report shows that the intent is to dumb down TLC to make it a real beginner friendly loop while keeping some of the challenges for more advanced riders. HK is a very tough place to learn the ropes of MTB. Can you imagine starting your first ride on an MTB straight down Ho Pui from Route Twisk? Even my first foray down Ho Pui in 1999 resulted in trail rash, cuts, broken helmet and wrecked wheels and I was an experienced XC rider from Canada. In other parts of the world world there are rutted fire roads to get used to the rough stuff before venturing down the technical stuff. From a sports development perspective we do need a few easy trails ... and the more people who have a good start in MTB and stick with it rather than posting an ad on 28bike.com the more funding and attention we will get. Numbers matter for MTB in HK.